Ettore Sottsass was born in Innsbruck, Austria 1917. He received his degree in Architecture from the Turin Polytechnic in 1939. In 1947 he opened a studio in Milan specializing in both architecture and design. In 1958 he began working with Olivetti as a Design consultant. Among other things, in 1959 he designed the first Italian computer and later several peripheral units and computer system as well as typewriters including Praxis, Tekna, Editor and Valentine. This last design is part of the permanent collection of the Museum of Modern Art in New York. In 1981 he and various collagues, friends and internationally renowned formed Memphis. This group soon became the symbol of New Design and a major voice in avant garde contemporary design. 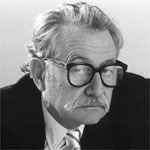 One year later he founded Sottsass Associati, The Studio where he continues to work as an architect and designer. Several of his design are part of the permanent collections of leading museum throught the world: New York, Paris, Sydney, Denver, Stockholm, London, San Francisco, Toronto, etc. In 1993 he received an honorary degree from the Rhode Island School of Design and in 1994 he received the IF Design Award Kopfe from the Indrustrie Forum Design in Hannover. The same year The Centre National d'Art et de Culture George Pompidou in Paris Sponsored as an extensive retrospective exhibit of his works. He was awarded Design Plus in 1998 in Frankfurt Messe for Marutomi collection.